Alewives (Alosa pseudoharengus) and blueback herring (Alosa aestivalis), collectively referred to as river herring, are anadromous fish, which means they spend most of their adult lives at sea but spawn in freshwater. The two species look very similar. Fishermen usually harvest both species together and generally do not distinguish between the two. In Downeast Maine, alewives are more common than bluebacks and locals often use the terms “alewives” to refer to both species. Residents of Downeast Maine have harvested alewives and bluebacks in the spring during their upstream spawning migration for centuries. To this day they retain an important role in the fishing-based economy of the region. To learn more about the history of river herring fishing in Downeast Maine, visit the Fisheries Then section of this site. This piece describes river herring fisheries in Downeast Maine from the mid-1990s through the present. The mid-1990s could be considered the beginning of the modern day river herring fishery in Downeast Maine, as it was around this time that many towns re-opened their rivers to fishing after closing them for several years due to concerns about overfishing. River herring were once an important food item for residents of Downeast Maine. Modern-day Mainers for the most part do not have the patience to pick out the many small bones from a river herring, nor do they enjoy the “fishy” taste. The amount of river herring currently harvested for human consumption is very small compared to the amounts historically consumed in this area. 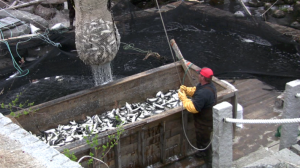 The Downeast Salmon Federation (a site on the Downeast Fisheries Trail) is working to maintain the tradition of river herring as food by operating a “heritage smokehouse” in East Machias where alewives and bluebacks are smoked after first being soaked in brine. The Downeast Salmon Federation has worked with local harvesters and other organizations to share smoked river herring with community members and also to bring them into local schools. Eventually these efforts led to the development of an annual river herring celebration called the Bloater Bash. The term “bloater” refers to smoked whole river herring, which are served at the Bash (Dwayne Shaw, personal communication). Though river herring are no longer a popular food item, they are highly sought after for bait, especially in Maine’s lobster fishery, the largest fishery in the state in terms of both landings and value. According to Jake Sutherland, the river herring harvester for the town of Orland, fresh river herring make excellent lobster bait in the spring of the year. At other times of year lobsters are not as attracted to river herring and prefer other baits such as salted Atlantic herring (a close relative of alewives and bluebacks). According to Sutherland, this change in bait effectiveness coincides with the timing of the mid-summer lobster molt. In order to grow, a lobster must shed its exoskeleton and grow a larger one to replace it. Lobster landings in Maine peak during mid-summer when lobsters come close inshore en masse to shed their old shells. Prior to the molt, fresh river herring bait generates high lobster catches. After the molt, river herring bait is not as effective. River herring are also in high demand for halibut bait. Maine’s river herring and Atlantic halibut fisheries overlap in time and space. Many Maine halibut fishermen think that when it comes to bait, “the fresher the better.” A river herring can easily go from the river to a halibut fisherman’s hook within 24 to 48 hours (Beaty 2014). River herring are used to a small extent as bait in recreational fisheries targeting striped bass and other sport fish. River herring used for this purpose are mostly harvested by recreational fishermen under the provision in Maine’s fishing regulations that allows for harvest of up to 25 river herring per day, Sunday through Wednesday, for recreational or personal use (Maine Department of Marine Resources 2012a). The state of Maine does not keep records of recreational landings, but the amount of river herring used for this purpose is presumably very small (Maine Department of Marine Resources 2010). For a relatively brief period of time during the 1980s, river herring from Downeast Maine were processed into pet food. This practice was relatively short-lived as it contributed to overharvesting in some areas (Darrell Young, personal communication). Total revenue from the sale of river herring in Maine averaged $331,180 per year between 2009 and 2013, a substantial increase over the previous two decades, as a result of both increased demand and increased abundances of river herring in some rivers (Maine Department of Marine Resources 2014a; Claire Enterline, personal communication). The indirect economic benefits of the fishery, such as providing bait for the lobster fishery, are much greater than the direct revenue to commercial harvesters. Few studies have quantified the economic impact of river herring in the lobster fishery; however, one recent analysis suggests that the benefits of river herring from the St. Croix River alone could be measured in millions of dollars (Cap Log Group 2011). Most towns that allow commercial harvest of river herring benefit directly from the fishery by charging commercial harvesters a flat fee for the right to harvest, or a percentage of their profits. The Atlantic States Marine Fisheries Commission (ASMFC) oversees river herring fisheries along the entire U.S. East Coast. The Maine Department of Marine Resources (DMR) works within the ASMFC’s general guidelines to manage river herring fisheries at the state level. For the most part, river herring fisheries in Maine are managed cooperatively between the DMR and local municipalities (Atlantic States Marine Fisheries Commission 2012). In 2014, 40 towns in Maine filed plans with the Department of Marine Resources to manage river herring runs within their borders. Twenty-two towns managed commercial harvests, some working together to jointly manage fisheries in one river. Twelve towns filed rights for conservation closures that prohibited the harvest of river herring. Six towns closed their waters to commercial harvest of river herring, but allowed recreational fishing. Towns with commercial harvest plans in the Downeast area in 2014 include Orland, Ellsworth, Franklin, Sullivan, Gouldsboro, Steuben, Cherryfield, East Machias, and Perry. 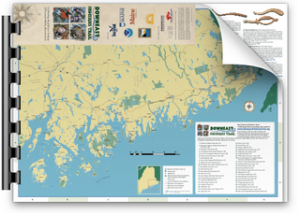 The Downeast towns of Pembroke and Penobscot allow recreational, but not commercial harvest. Downeast towns with conservation closures include Mount Desert, Tremont, Surry, and Gouldsboro (Maine Department of Marine Resources 2014c; Claire Enterline, personal communication). For a town to manage a commercial river herring harvest, the DMR requires evidence of a self-sustaining population. Towns must present at least four years’ worth of data on river herring abundance to demonstrate that the population is large enough and stable enough to support a commercial fishery. Town harvest plans must include conservation measures such as a 72-hour weekly fishing closure and minimum escapement goals (meaning that a certain number of fish must make it upstream past a certain location). The DMR also works with towns to collect scale samples to determine the age of the fish and spawning frequency. This information is useful for monitoring river herring populations. A relatively high number of “repeat spawners” is one indicator of a healthy population (Claire Enterline, personal communication). Most commercial harvest plans allow for harvest at a single location within the town. Rights to harvest are usually leased to one or more individuals. Some towns designate “fish agents” or “fish committees” to oversee the harvest and provide stewardship of the run (Maine Department of Marine Resources 2012a; Maine Department of Marine Resources 2012b). Alewives and bluebacks are harvested with many different types of gear including weirs, a variety of nets and traps, and occasionally hook and line. Fishermen usually target them in locations where natural or man-made structures cause the fish to gather together. For example, if a river is blocked by a dam and a fish ladder provides the only path upstream, then the fish will congregate near the ladder. In free-flowing sections of streams and rivers they tend to gather in calm pools where they can rest on their journey upstream. These aggregation sites can make for excellent fishing spots. Below are some examples of the different ways in which river herring are currently harvested in Downeast Maine. River herring are harvested from the Union River with the aid of a fish trap that was originally constructed in 1974 to aid in salmon restoration efforts. Two dams on the river block the passage of migratory fish. The lowermost dam is a 65-foot hydroelectric dam near downtown Ellsworth. This dam is fitted with a trap designed to capture salmon and river herring so that they can be transported around two dams and released to continue on their upstream spawning migrations. The Ellsworth municipal management plan requires that at least 150,000 river herring be removed from the trap and transported by truck to their upstream spawning grounds each year. Once this target is reached, most of the alewives and bluebacks subsequently caught in the trap are sold to commercial fishermen who use them as bait for lobster and halibut (Union River Fisheries Coordinating Committee 2010; Rick Welch, personal communication). River herring are harvested from the Orland River in Orland, Maine with a tidal weir. Weirs are structures that block the path of migrating fish and divert them into holding pens from which they are easily harvested. Each spring the Orland weir is built downstream of a small dam. 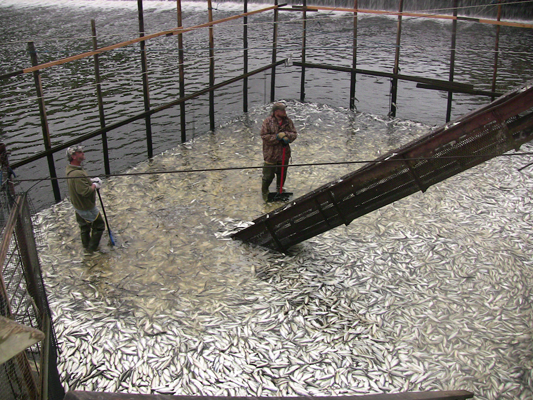 At low tide, water levels in the holding pen are low enough that the fish trapped inside are exposed to the air. They are lifted by conveyor belt from the pen to the back of the truck. Lobster and halibut fishermen line up along the river bank to buy a few hundred alewives and bluebacks at a time to use as bait. The Orland town harvest plan includes a 72-hour weekly fishing closure. During the weekly closed period the pen is left open on either end so that the fish are able to pass through the weir and make their way upstream of the dam by way of two small fish ladders (Jake Sutherland, personal communication). Darrell Young, the river herring harvester for the town of Franklin, has designed a trap to block the passage of fish beyond a bridge that crosses Grist Mill Stream. Grist Mill is not a wide stream and the trap blocks the width of it. The trap consists of a large bag-like net with an opening that faces downstream. The bottom of the net is held underwater with sandbags. Before harvesting from the trap, Young and one of his assistants wade in the stream and walk toward the trap while banging on rocks in the stream bed with metal pipes, making loud noises to scare fish into the trap. Once the trap is full, they close it and use a large dip net to transfer the fish to a large wooden box. After several passes of the net, the box is full of alewives and bluebacks. The fish are lifted by the bucket-full up to the road above where they are sold to waiting customers (Darrell Young, personal communication). The harvest plan for the town of Franklin includes a 72-hour weekly closure and requires that 100 bushels of river herring (approximately 1,200 fish) make it upstream of the harvest location before the commercial harvest can begin (Claire Enterline, personal communication). At Boyden Stream in Perry, alewives and bluebacks are harvested by dip net out of a fish ladder built around a dam. On days when commercial harvest is allowed, a screen blocks fish passage beyond the ladder, facilitating harvest. During the 72-hour weekly closed period, the screen is removed and the fish are allowed to move upstream freely. The fish harvested from this location are mostly sold for use as bait, but the harvesters also give small amounts of fish to local residents for personal use (Chris Bartlett, personal communication). In locations where river herring are harvested commercially, harvesters carry out much of the stewardship work mandated in the town management plan. In many cases, they go above and beyond what is required in the plan. Such work includes estimating the number of river herring that make it upstream of a certain location, recording harvest data, collecting scale samples, clearing obstacles from streams, monitoring fishways to ensure that they are in proper working order, and, in the case of the Union River in Ellsworth, transporting a certain number of river herring by truck to Graham Lake every year. Because river herring return to the ponds and streams where they hatched, harvesters have a major incentive to carry out this work. Their work to maintain and build river herring populations in their local streams can lead to increased catches and increased profits in the future. The work of harvesters seems to be paying off. Most commercially harvested river herring runs in Maine are either stable or increasing (Maine Department of Marine Resources 2010). Many harvesters have seen increases in river herring abundances in their local rivers. Although most commercially harvested river herring runs in Maine are either stable or increasing (Maine Department of Marine Resources 2010), river herring populations have not fully recovered to their historic abundances. In 2012 the Atlantic States Marine Fisheries Commission performed a benchmark stock assessment of river herring throughout their range in the U.S., which extends from Maine to North Carolina. This assessment found that both species were “depleted to near historic lows” (Atlantic States Marine Fisheries Commission 2012). During the 1990s, many states along the East Coast saw declines in river herring landings and abundance estimates from monitoring surveys. In 2006 NOAA’s National Marine Fisheries Service (NMFS) listed both alewives and bluebacks as “species of concern” (National Marine Fisheries Service 2009). The species of concern label triggers no special protections, but rather is meant to call attention to pressing research needs and to encourage the consideration of proactive measures to conserve and restore populations (National Marine Fisheries Service 2013b). In 2011 the Natural Resources Defense Council petitioned the National Marine Fisheries Service to list both alewives and bluebacks as endangered or threatened under the Endangered Species Act (ESA) throughout all or a portion of their range. In 2013 NMFS decided that listing was not warranted, but committed to re-examining their status under the ESA within five years (National Marine Fisheries Service 2013a). In the meantime, researchers are studying multiple aspects of river herring populations. Declines in river herring abundances along the east coast have been attributed to a variety of factors. The most pressing threat to river herring in New England is habitat loss, fragmentation, and degradation due to the construction of dams and other obstructions in many rivers. Dams prevent alewives and bluebacks from reaching their spawning grounds. They also cause changes in sedimentation and alter the structure and temperature of rivers, all of which can affect fish populations (Hall et al. 2010). 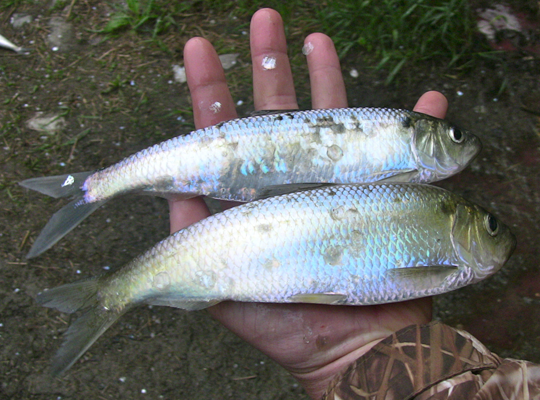 Changing predation rates may also impact river herring populations. Sport fishermen have welcomed the increased abundance of striped bass in areas south of Maine in recent years; however, this increase has also raised concern about predation rates on river herring. Studies on striped bass predation to date reveal inconsistent trends (National Marine Fisheries Service 2013a). Overfishing of river herring was not a major concern until foreign vessels began harvesting large quantities of fish off the mid-Atlantic coast in the 1960s. This practice continued until the 1976 Fishery Conservation and Management Act established the sovereign right of the U.S. to manage fisheries out to 200 miles from its shores, effectively barring foreign fishing vessels from harvesting fish off the U.S. coasts (National Marine Fisheries Service 2009). Though river herring are not currently the target of any at-sea fisheries, they are caught at sea as bycatch in fisheries targeting other species, including Atlantic herring and Atlantic mackerel. The Atlantic herring and mackerel fisheries rely on high-volume catches to make profits. High-volume harvests pose difficulties for estimating bycatch of river herring and other species. Though uncertainty persists about the amount of river herring caught as bycatch in these fisheries, recent studies suggest that this bycatch could pose a significant threat to alewife and blueback populations (Atlantic States Marine Fisheries Commission 2012; Bethoney et al. 2014). The effect of climate change on river herring populations is another top research priority. Scientists predict that climate change will affect precipitation, stream flow, and water temperature, all of which will likely impact river herring populations. An analysis of catch data from the Northeast Fishery Science Center’s long-term bottom trawl survey suggests that the at-sea distribution of river herring has already shifted north and to greater depths as a result of warming ocean temperatures. Additional studies are currently underway to assess other impacts that climate change may have on river herring populations (Nye et al. 2012). Hydropower has a longstanding and continued relevance in Maine’s economy; however, dam removal efforts have gained traction in recent years. The amount of spawning habitat accessible to alewives and bluebacks in Downeast Maine has increased over the past fifteen years due to a combination of high-profile dam removals and several smaller projects to improve fish passage at remaining dams. A dam on the East Machias River, which had blocked most fish passage since 1926, was removed in 2000. The dam had fallen into disrepair and posed a safety hazard, which prompted the town of East Machias to seek its removal. Dam removal is often a costly process, but in this case a unique collaboration lead to a successful, timely, and cost-efficient removal. 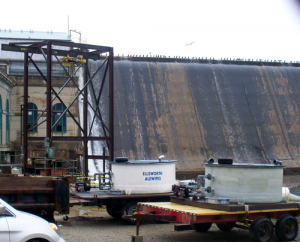 The Downeast Salmon Federation was instrumental in raising funds for removal and a team of Air Force Reservists dismantled the dam as a training exercise, greatly reducing the cost to the town. President Bush lauded this collaborative effort with an award ceremony in Washington D.C. in 2002 (Natural Resources Council of Maine 2003). According to Dwayne Shaw, the executive director of the Downeast Salmon Federation, “This community had a long heritage of connection to the river through alewives and salmon.” This dam removal effort and other projects of the Downeast Salmon Federation have helped to restore that connection. In 2012 and 2013 the efforts of the Penobscot River Restoration Trust led to the removal of the Great Works dam in Old Town and the Veazie dam in Veazie. These dams had blocked fish passage in the Penobscot River for nearly two centuries. Around the same time a modern fish lift was installed at a remaining dam in Milford. The new fish lift operates much like an elevator for fish. River herring and other fish were first able to use the new lift starting in 2014. As of August 4, 2014 the lift had transported 253 endangered Atlantic salmon, 187,429 river herring, 805 American shad, 18 striped bass, and 641 sea lamprey over the dam (Maine Department of Marine Resources 2014d). More work remains to be done, including the construction of a bypass around an additional dam in Howland, and restoration work in tributaries of the river. The Penobscot River watershed is the largest in the state and it is hoped that efforts to restore this river system will have wide-ranging benefits. River herring are a major focus of this restoration effort due to their widely-recognized ecological importance (Penobscot River Restoration Trust 2013). The Somes-Meynell Wildlife Sanctuary (a site on the Downeast Fisheries Trail) has been working to restore access to river herring spawning habitat in a watershed on Mount Desert Island where four dams still block fish passage. The Sanctuary worked with local partners to renovate fish ladders at four dams. “We started with a run that was pretty much defunct and brought it back up to close to 40,000 in-migrating adults,” said David Lamon, executive director of the Sanctuary. “Each year we see a steady increase and we’re monitoring the run with community support and volunteer efforts.” A Citizen Science Corps and students at the local high school help to collect data on the river herring runs each year. Lamon sees community engagement as a key factor in the success of their project (David Lamon, personal communication; Idlebrook 2007; Somes-Meynell Wildlife Sanctuary 2014). Starting in the late nineteenth century, six dams were constructed along the St. Croix, substantially diminishing the amount of spawning habitat available to river herring and other diadromous fish and causing their populations to decline. Fishways were installed at the dams but allowed only modest amounts of fish to access upstream areas. In 1981 a new fishway was installed at the dam in Milltown, New Brunswick, leading to a resurgence in river herring in the area. Over 2.5 million river herring made it above the first three dams on the St. Croix in 1987, up from approximately 169,000 in 1981 (International Joint Commission 2008). A coincident decline in smallmouth bass in nearby Spednic Lake alarmed many. Sportfishing for smallmouth and other game fish had become an important part of the local economy and local residents were concerned that the resurgence of river herring was negatively impacting smallmouth bass populations. This concern eventually led the State of Maine to pass emergency legislation to block river herring passage at two dams on the St. Croix starting in 1995. River herring numbers subsequently plummeted to an estimated 900 returning individuals in 2002 (Willis 2006; International Joint Commission 2008). Debates over the interactions between river herring and smallmouth bass in the St. Croix watershed and what to do about it were contentious. Smallmouth bass are not native to the St. Croix watershed; they were likely introduced in the late nineteenth century. By the 1980s, smallmouth populations were well-established and native river herring populations had been relatively small for quite some time due to poorly maintained fish ladders at multiple dams. Little evidence existed to support the claim that river herring had detrimental effects on smalmouth bass abundances, aside from a coincident decline in smallmouth numbers in Spednic Lake and an increase in river herring; however, because sportfishing had become such an important part of the local economy, even the possibility of a negative impact caused substantial concern (International Joint Commission 2005; Willis 2006). In 2013 the Maine state legislature passed “an Act to Open the St. Croix River to River Herring.” This Act essentially reversed the 1995 legislation that had been so detrimental to river herring in the St. Croix. Effective fish passage was mandated at the two dams that were impassable for almost two decades. As of 2013, river herring can now access about 50% of their historic upstream spawning habitat in the St. Croix watershed, compared to the 2% that they had access to from 1995 until 2013 (National Marine Fisheries Service 2013b; Sharon 2013). Because river herring spend an average of four years at sea before returning to freshwater to spawn, the benefits of restored fish passage on the St. Croix will likely not be evident for several years. Modest returns of river herring were counted at the fish trap at the Milltown dam in 2014 (Atlantic Salmon Federation 2014). River herring have served many uses in Downeast Maine throughout history: as food, as bait, as fertilizer, as a symbol of the return of spring. In recent times they have gained popularity for a new reason: the potential that they hold for the restoration of other iconic fish species in the area. It is increasingly recognized that restoring river herring populations to historic abundances is a necessary step in restoring populations of their predators that have also suffered from overfishing, habitat reduction, and other human impacts. River herring could also play a key role in the recovery of endangered Atlantic salmon in Maine. At historic abundances, river herring were likely prey for both juvenile and adult Atlantic salmon. At high abundances they may have also provided an alternative food source for predators of Atlantic salmon (this idea is known as the prey buffer hypothesis). A variety of management agencies, non-governmental organizations, academics, and fishermen are now calling for a multi-species approach to the recovery of Atlantic salmon. River herring are seen as a key component of this multi-species approach (Saunders et al. 2006). As conservation and restoration efforts expand throughout Downeast Maine and beyond, it is hoped that river herring populations will rebound and spread ecological, cultural, and economic benefits throughout the region. Ames, E.P., and J. Lichter. 2013. Gadids and alewives: structure within complexity in the Gulf of Maine. Fisheries Research 141:70-78. Atlantic States Marine Fisheries Commission. 2012. River herring benchmark stock assessment, volume II. Atlantic States Marine Fisheries Commission Stock Assessment Report No. 12-02. Alexandria, VA.
Baird, S.F. 1873. United States Commission of Fish and Fisheries. Report of the Commissioner, part II: Report on the Condition of the Sea Fisheries of the South Coast of New England in 1871 and 1872, with Supplemental Papers. Washington, DC: U.S. Government Printing Office. Beaty, J. 2014. Assessing growth and habitat preferences of Atlantic halibut using biological samples and fishermen’s knowledge. Masters’ thesis, University of Maine School of Marine Sciences, Orono, ME. Bethoney, N.D., K.D.E. Stokesbury, B.P. Schondelmeier, W.S. Hoffman, and M.P. Armstrong. 2014. Characterization of river herring bycatch in the northwest Atlantic midwater trawl fisheries. North American Journal of Fisheries Management 34:828-838. Cap Log Group, LLC. 2011. Economic benefits of a bait fishery for alewives on the St. Croix River. Hall, C.J., A. Jordaan, and M.G. Frisk. 2011. The historic influence of dams on diadromous fish habitat with a focus on river herring and hydrologic longitudinal connectivity. Landscape Ecology 26:95-107. Idlebrook, C. 2007. Fish ladders return to Somesville. Working Waterfront/Inter-Island News, April. International Joint Commission. 2008. St. Croix River: state of the watershed report – Maine and New Brunswick. International St. Croix River Watershed Board, International Joint Commission, Canada and United States, /mainerivers.org/wp-content/uploads/2009/06/St.-Croix-State-of-the-Watershed.pdf. International Joint Commission. 2005. Board discussion paper on alewife in the St. Croix River. International St. Croix River Watershed Board, International Joint Commission, Canada and United States. Maine Department of Marine Resources. 2010. Maine ASMFC river herring sustainable fishing plan, Sustainable fishing plan required by the Atlantic States Marine Fisheries Commission’s Amendment 2 to the Interstate Fishery Management Plan for Shad and River Herring, asmfc.org/files/RiverHerringSFMPs/ME_RiverHerring_SFMP.pdf. Maine Department of Marine Resources. 2010. Maine ASMFC river herring sustainable fishing plan, asmfc.org/species/shad-river-herring. Maine Department of Marine Resources. 2012a. Department of Marine Resources Regulations. Chapter 30: river herring. Maine Department of Marine Resources. 2012b. Maine river herring fact sheet, maine.gov/dmr/searunfish/alewife/index.htm. Maine Department of Marine Resources. 2014a. Historical Maine alewife landings, 1950-2013, maine.gov/dmr/commercialfishing/historicaldata.htm. Maine Department of Marine Resources. 2014b. Historical Maine American lobster landings, 1950-2013, maine.gov/dmr/commercialfishing/historicaldata.htm. Maine Department of Marine Resources. 2014c. Summary of town river herring rights. National Marine Fisheries Service. 2009. Species of concern: river herring (alewife and blueback herring) Fact sheet, nmfs.noaa.gov/pr/pdfs/species/riverherring_detailed.pdf. National Marine Fisheries Service. 2013a. Endangered species act listing determination for alewive and blueback herring. Federal Register 78(155): 48944-48994, 12 August 2014. National Marine Fisheries Service. 2013b. Proactive conservation program: species of concern, nmfs.noaa.gov/pr/species/concern/. National Marine Fisheries Service. 2013c. Update on river herring. NOAA Fisheries Greater Atlantic Regional Office, greateratlantic.fisheries.noaa.gov/stories/2013/rhupdate.html. Natural Resource Council of Maine. 2003. Toward a new balance in the 21st Century: a citizen’s guide to dams, hydropower, and river restoration in Maine. Augusta, ME, nrcm.org/our-maine/publications/a-citizens-guide-to-dams-hydropower-and-river-restoration-in-maine/. Nye, J.A., P. Lynch, M. Alexander, C. Stock, and J. Hare. 2012. Results of preliminary analyses of the effect of climate change on river herring. Fisheries and the Environment (FATE) Annual Report 2012. Woods Hole, MA: NOAA Northeast Fisheries Science Center. Penobscot River Restoration Trust. 2013. Penobscot River Restoration Trust fact sheet, penobscotriver.org/assets/Fact_Sheet_Oct17_2013.pdf. Saunders, R., M.A. Hachey, and C.W. Fay. 2006. Maine’s diadromous fish community: past, present, and implications for Atlantic salmon recovery Fisheries 31(11):537-547. Somes-Meynell Wildlife Refuge. 2014. Somesville Fish Passage Restoration Project, somesmeynell.org/?page_id=125. Union River Fisheries Coordinating Committee. 2010. Comprehensive fishery management plan for the Union River drainage, 2011-2014. Willis, T.V. 2006. St. Croix River alewife-smallmouth bass interaction study, Final report to Maine Rivers. Hallowell, ME: Maine Rivers.